Today's prompt is ruin(ed). This is the lock and chain that was ruined when vandals cut through the lock. 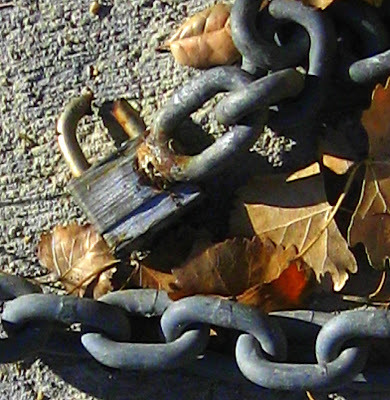 The chain was strung across an access to an urban trail. It's purpose was to keep out vehicles, and leave the trail open for hikers and dirt bikers. Mine is, Yen's PH. Happy Weekend!! Good photo. Wow, what it took to break the iron?! I did Photo Hunt today, too. I hope you get a chance to visit and leave your link! That is a fine picture - very fine.